Are you and your photography clients on the same page? Been surprised with all of the outfits and props the mom had planned for her newborn’s session? Been thrown off-guard by how uninterested and bored your high school senior was? Had an unhappy bride due to a shot you missed at her wedding, and she swore she told you about it? Had a family unexpectedly bring along their grandparents to jump in a few photos? You would be surprised as to how many of these unwanted situations could be easily avoided with a simple questionnaire given to your photography clients prior to their session or wedding! Many unhappy and dissatisfied photography clients could be prevented with simply communication from the beginning. 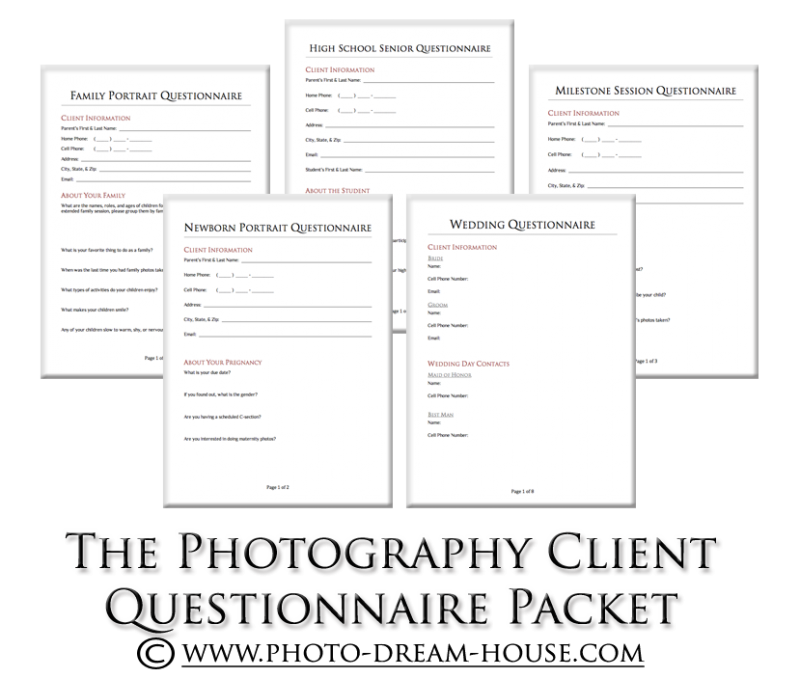 With The Photography Client Questionnaire Packet, your clients can freely express their thoughts and feelings about their upcoming photo shoot or wedding. And, you will know exactly what their expectations are. And, if there does happen to be any confusion, it is cleared up well before you even snap a photo. What’s included in The Photography Client Questionnaire Packet? Each of these questionnaires contain multiple pages of questionnaires for your client. The Newborn Questionnaire has 2 pages, the Wedding Questionnaire has 8 pages, and the others all have 3 pages. I have had over 6 years of experience and done hundreds of these types of sessions and weddings. There is not much I haven’t seen, and I have integrated those experiences into these questionnaires. 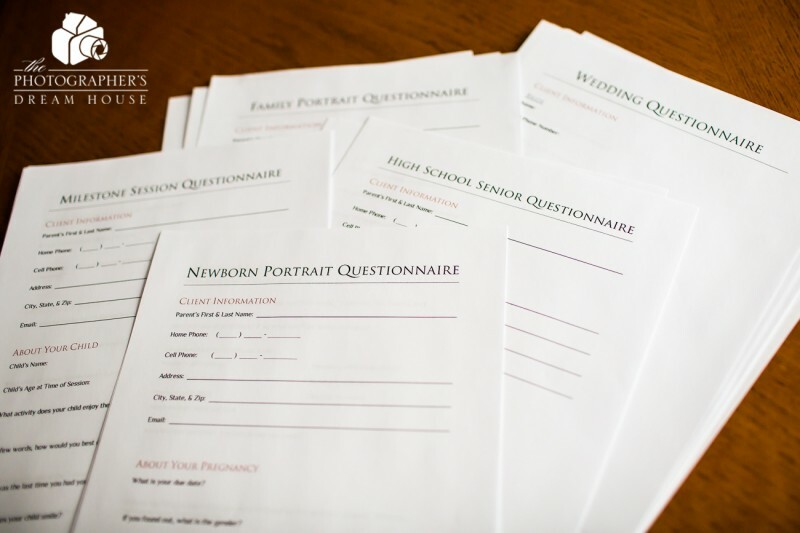 Finally, you can customize each of these photography questionnaires with your logo and brand. Why do I need this questionnaire packet? You will never have to go into a photography session feeling unsure of what your client’s expectations are. These questionnaires will make sure you and your clients are always on the same page.In addition, you will show your clients how organized you are, and you are more than prepared for their session or wedding. How much does the photography client questionnaire packet cost? For the entire packet, it is only $39.99!